We all get stuck sometimes. We think we know what to write. But when we open a Word doc, the words don’t flow. We try to blame it on writer’s block. Our muse has left us. Today we don’t feel inspired. We’re still confused about what we want to communicate. We wrestle with complexity. We don’t know the essence of our unwieldy idea. A few simple principles can help you distill the essence of your message, and communicate with power and clarity. Ever feel like an idea is too multi-faceted with threads of thoughts moving in all directions? Step back and isolate one simple question. Consider a subject you wish to understand, and clear the clutter until you have isolated one essential ingredient. Each complicated issue has several possible core ideas. You are not seeking “the” essential idea; you are seeking just one—consider a subject and pare it down to one theme. Let’s say you want to write a post about how to build a thriving business online. This question is complex and unwieldy. 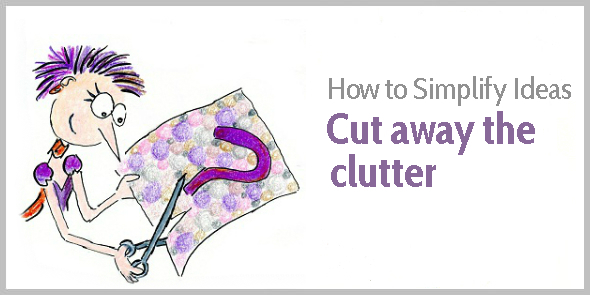 The principle of cutting away the clutter to clarify an idea sounds straightforward. When is nuance helpful and when does nuance become clutter? Imagine a remote control with only an on/off button. It’s simple, but not very useful, is it? To add more functionality, you need more buttons, so complexity increases. But how many buttons does a remote control need? The answer depends on the user’s wishes and what product he wants to control. A similar tension exists in writing. How simple can you make your message? When have you cleared so much clutter that your content becomes meaningless? To understand when nuance becomes clutter, think about your reader. What information is essential so he can understand your ideas and follow your advice? Achieving simplicity requires taking a step back and then looking at your content again with fresh eyes. What’s the aim of your content? And how can you simplify your writing to achieve that aim? Shane Parrish suggests that even Charles Darwin found it hard to express himself clearly and concisely. Darwin wrote down his ideas quickly, and then went back to them again and again. A reiterative revision process. When you give your ideas time to blossom, you give yourself an opportunity to make your writing clearer. So write your content over several days. And don’t stop writing after you’ve answered one question. Revisit topics to deepen your understanding. Find an even simpler question or branch out to follow different threads of thought. You can understand anything better than you currently do. One blog post has the perfect length to answer one simple question. But what if your readers ask complex questions? And what if you want to help them make sense of complexity? This is where organization comes in. You can apply a similar principle to your blog. First, create a series of blog posts answering the simple questions. 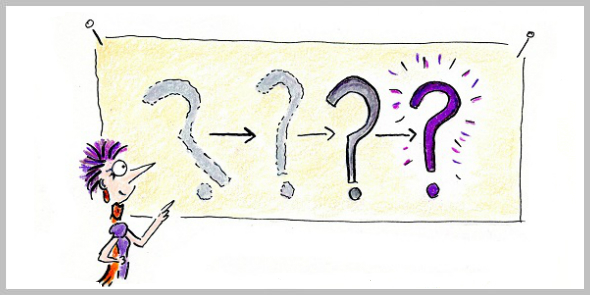 Then, create a page or blog post as a collection of these questions—show how you break down a complex question into smaller questions. Such content is often called cornerstone content. Which writing techniques do you need to learn? What writing habits can we nurture? How can we write with substance? Where do we find inspiration to keep improving our writing? How do you choose words? How do you make your writing flow smoothly? How do you use metaphors? How do you write mini-stories? Once you’ve answered the simple questions, answering a big question becomes easier. A matter of organization. When I wrestle with an unwieldy topic, I start scribbling. Even writing down a few words and drawing arrows can help clarify my thoughts. Stop thinking of drawing as an artistic process. Drawing is a thinking process. Learning to write well means learning to think well. And that means re-learning how to ask questions. Remember when you were a kid, and kept asking questions? Look at the world again with fresh eyes. Be a child again. Learn to be comfortable with not knowing answers, and you’ll discover new lessons and fresh ideas. That’s how you learn more and enrich your life. Yes, that’s an excellent point. I think I use two tactics: (1) make the question small enough so I can answer it in 1,000 words and once I’ve answered the question I’m ready (and I can move on to the next question); (2) limit my time – a blog post has to be finished every Tuesday, and at some stage I have to stop researching so I can start writing and publish a post. Reducing the complex to simple… I can remember tackling this skill the first time at high school. I think it was called ‘précis’ and I found it hard. Fast forward many years, and it’s still challenging! Writing (or drawing) something with impact often seems to build down to isolating ONE theme or question (as you point out) that makes sense to your audience. That boils down to knowing your audience again, doesn’t it? And then including just enough information for them to achieve something with it immediately. I love the Dan Roam quote — I’ve always been doodler, drawing or making notes in order to think :). It’s probably strange, but I can’t even remember having to do something like that at school, and I can’t remember either whether they taught any techniques for writing a précis. This is a highly crucial topic for all bloggers because every niche has complex topics that we try to tackle on a day today basis as we create new content. It is not very easy apart from the other blogging tasks we do on a regular basis. You have neatly broken down the working tips here! I see that reducing clutter helps a lot. To me, it is always about clarity and being on point. The more clutter we add, the more complex we make the topic (which is already complex in itsef). Yep, that’s so true. Clutter increases complexity. Unfortunately, many bloggers recommend to write in-depth posts, so a lot of blog posts suffer from clutter and complexity. That’s so true! Start with one unwieldy idea and turn it into a series of posts. 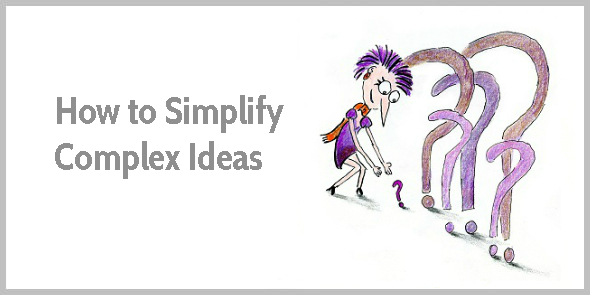 This way, you’ll never run out of blog post ideas. I’m Issa, a long-time reader and fan of your superb website. This post came right on time. The steps are concrete and actionable- I can’t wait to put them into use. I read and re-read your blog series on business blogging- they’re inspiring and immensely helpful. I love how you concluded the post, too. I needed this reminder to keep an open-mind and think like a child. More power and thank you for holding my hand while I learn how to walk (write). The idea that you aren’t trying to come up with “the” essential idea is a brilliant point. When you want everything you write to be ‘great’, it’s easy to get too caught up in trying to find the ‘perfect’ idea, rather than picking one of several important ones. I often catch myself staying too long in a loop with writing and rewriting… I think that #4 and #5 help me the most, mainly drawing on paper (often diagrams). Ah yes, me, too. I can endlessly write and rewrite, too. Thank you for stopping by, Thuy! I enjoyed your post. It reconfirmed the need for me to break-down my thoughts and simplify my content for my business’s website. I am enrolled in CopyBlogger’s Master class and in the process of building my online site. At times it feels overwhelming… ! Your message came at the right time. Thank-you. I’m happy to read that this came at exactly the right time for you, Diana. Good luck with creating your website! great process for gaining clarity! a new tool i’ve started using is ‘The Hemingway App’ (there is a free web based version although I sprung for the desktop version) that will help you reduce the complexity of your writing. this is only useful AFTER you’ve simplified the ideas + content itself. once you’ve done that, this tool can help you then express it more simply + clearly. Yes, that’s a great tool! You’re adding an excellent point – once you’ve simplified your ideas, there’s still the process of simplifying your sentences. Simplification is hard work, isn’t it? Henneke, Really helpful, especially the keeping things simple, but not too simple part. It amazes me how the brain puts out too much at first and then must be reduced. You’d think it would be the opposite. Interesting reading! Yes, it’s a fascinating process of expansion and reduction. this is perfect timing once again. I just set up my new website and my brain is going into chaos mode as soon as I start to write. The worst thing about it is my current home page tagline: “Start your business with Clarity”. Waaahhh, where has my own clarity suddenly gone? Your tips are very helpful indeed. Good luck with your new site, Kerstin! Hi Henneke, a very good post. Your item 4, organise, is a great way to sort out a complex topic. 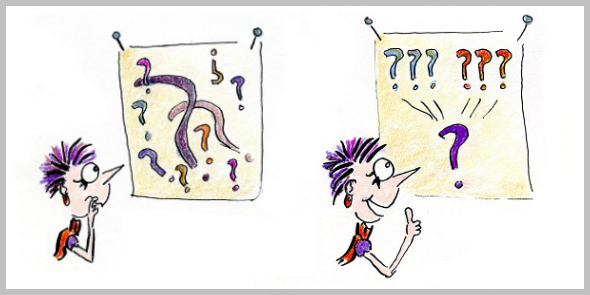 Your question-mark diagram is similar to mind mapping where you can lay out the ideas and sub-ideas that add up to the main point. It then easy to see and discard the “clutter” items which belong in another chapter, or are not required at all. Thank you, Paul. I hadn’t looked at it as mind-mapping, but you’re absolutely right! Hi Henneke, “Learning to write well means learning to think well.” This seems to me to be the heart of the challenge of creating simplicity from complexity. I appreciate your structured step-by-step approach and will give it a try. Thanks for another helpful solution to a thorny writing problem. Thank you, Amy, and good to “see” you again! What I liked about the book from Burger and Starbird is that they make it clear that we can all improve the way we think. school English teacher loved to assign a precis after everything we read, urging us to “capture the essence”. That’s the same thing you’re urging us to do! And, yes, organizing and rerererewriting to condense and clarify is still hard! And don’t forget to read every rewrite out loud. Henneke, thanks for much for this brilliant, eye-opening and simplifying post. I find that capturing the essence can be surprisingly hard. When we see how others have captured the essence, it seems obvious, until we try ourselves. Thank you for your lovely comment, Diane. I appreciate it! Perfect for me for now. I recently planned out a whole year of blog topics (one per week) and then felt the overwhelm. This should really help! I especially love “ask the right question”!!! You have shown me I probably just am procrastinating. Just what I needed to hear. I easily get overwhelmed by the complexity of an issue. p.s. I save all your posts. Yes, I know – it’s easy to get overwhelmed! I often try to decide what the next step is and focus on just that one step. This is my absolute favourite topic. Translating the complex into simple terms. Bite-sized chunks. Not an easy feat, but one that copywriters have to master. I thoroughly enjoyed your treatment of this topic…highly readable and entertaining as usual!!! Thank you for your lovely comment, Lee. The idea of writing a blog post or a novel can be quite easy. But it is a way complex than it seems when you start writing. Those questions come into your mind. How would you handle if someone asks the difficult question? I like the list of question you have made here. It’s important to start writing for a topic about which you want to know more, understand more. Cut those fussy thoughts and have a clear vision. I know that feeling, too, that I think something will be easy to write when I start, but pretty quickly I get stuck and can’t figure out how to move ahead. Hm..yes, it is all about simplification, in the end. About taking things apart and reverse engineering them. And to keep only the basics in your article. Yes, strangely enough, I couldn’t reverse-engineer my own process for simplification (other than cutting away the clutter), until I started reading the book by Burger and Starbird, and I slowly realized what I was doing. You have a great talent for transforming complex issues into simple ones, Henneke. Thank you for sharing ? Ha! You never say it, but for me, this was a perfection-buster post. I tend to be a “word perfectionist,” and can easily get lost in the weeds of honing THE one essential idea or word. 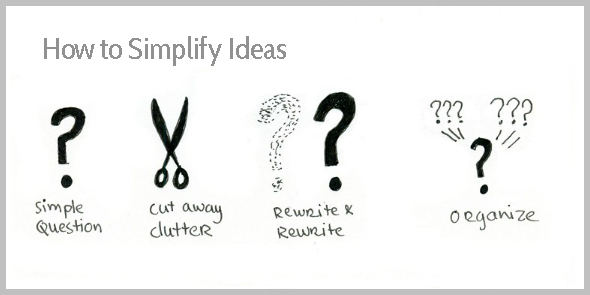 For writing, as with any practice we want to continue, we need to find “a way,” optimally a simpler way, not THE way. This reminder is liberating! You’re right. I hadn’t quite put my finger on it yet, but it IS liberating not to have to write the definitive post on the key idea. Finding one simple question instead and writing a valuable post about makes blogging weekly a lot more doable! Thank you for adding your thoughts, Gail. I appreciate it! “Ever feel like an idea is too multi-faceted with threads of thoughts moving in all directions?” ABSOLUTELY. And that’s one of my biggest hurdles that I face. Your step #3 is something that every writer needs to pay attention to. So many times people write the first draft and then that’s it, but they don’t realize that first draft might be too complicated for readers to understand. The art of revisions is key to getting your ideas across correctly. On another note, I’m super impressed by your art skills and Henrietta. I’ve been doing art as well, and it’s a great way to communicate your thoughts rather than just plain writing. Keep up the great work as always. Thank you for your lovely compliment. I’ve been drawing more recently, and I’m enjoying it a lot. PS Have you been binge-reading my blog? 😉 I hope you enjoyed it! My question is going to be from a marketing angle… regarding #3 “Rewrite and rewrite again”. Yes, it’s tricky. It’s easy to stay stuck in eternal editing mode. Is this valuable to my readers? You can also ask yourself: Would spending another hour editing improve the text exponentially? Years ago when I wanted to be a doctor with the added knowledge of using a computer to keep my data and retrieve as and when required in different algorithms, I had to go somewhere to learn how. I have always been based in India, so these thoughts in 1978/79 were considered vague and eccentric. However, I pursued my goal and got a class in a computer software school run by redundant IBM staff, as the company was asked to leave India along with Coca Cola in 1977 by a farmer led government. There I learned two subjects, Systems analysis and Cobol programming. Cobol flew quickly out if the cuckoos nest but systems analyses remained. A basic skill was flow charting any system in place for efficient use of resources and maximum results repeatedly. A basic programme. Your drawings Henneke, go beyond the boring polygons of flow charting to a simple and interesting technique which when used properly provides a means of amazing clarity in writing with added inspiration and fun. Bravo, once again. Your writing fascinates me. Wow, you’re a man of many talents, Nicolas! I love how you pursued your own ideas and decided to learn something even though others thought it was rather eccentric. Isn’t it amazing how we can learn a technique, and then we find out we can use it in other areas of our lives? I find this is true for drawing in general. Learning to draw has helped me to write better, too. It probably helps me think better, too, as it can help organize and clarify my thoughts. Thank you so much for stopping by again, Nicolas. I appreciate it. Thank you so much for your wonderful compliment on your writing. You wrote… ‘I felt that this charming vision has to be applied not only in writing but in every moment of Life.” I agree with your point. When we try to look at the world with fresh, childlike eyes, we can re-discover the beauty in so many small things. I appreciate you’ve stopped by to leave your comment.